Home » What is Instrumentation and Control ? 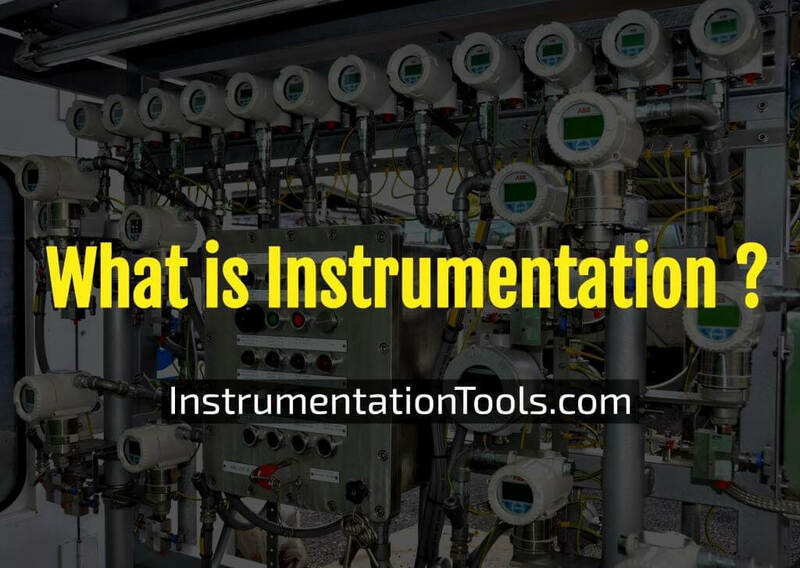 What is Instrumentation and Control ? Instrumentation is the branch of engineering that deals with measurement and control. An instrument is a device that measures or manipulates process physical variables such as flow, temperature, level, or pressure etc. Instruments include many varied contrivances which can be as simple as valves and transmitters, and as complex as analyzers. Instruments often comprise control systems of varied processes. The control of processes is one of the main branches of applied instrumentation. Control instrumentation includes devices such as solenoids, valves, circuit breakers, and relays. These devices are able to change a field parameter, and provide remote or automated control capabilities. Transmitters are devices which produce an analog signal, usually in the form of a 4–20 ma electrical current signal, although many other options using voltage,frequency, or pressure are possible. This signal can be used to control other instruments directly, or it can be sent to a PLC, DCS, SCADA system, or other type of computerized controller, where it can be interpreted into readable values and used to control other devices and processes in the system. Instrumentation plays a significant role in both gathering information from the field and changing the field parameters, and as such are a key part of control loops. pressure, either differential or static, flow, temperature, level, density, viscosity, radiation, process instrumentation etc … list goes on. To control the parameters in a process or in a particular system, devices such as microprocessors, microcontrollers or PLCs are used, but their ultimate aim is to control the parameters of a system. The purpose of an instrumentation engineer is to Conceptualize, Design, Detail, Maintain and Trouble shoot control system for its client/ industry. Changed mindset and government’s compliance put efforts to make safety as first priority against profits and production. When the word safety comes, I usually compare it with a vehicle which I am driving and suddenly I have to apply brakes. A good vehicle will immediately comes to a halt without skid and without harm to any passenger. It makes eyes and ears of industry’s happenings. Its an art and science of measurement and control. To list a few duties, the sensors selection and implementation, troubleshooting of all its functioning instruments & tuning its brain (control system) for best performance and response. Automation is the buzz word in process industry, and automation is the core job of instrumentation engineers. Hence, the demand for instrumentation will always be there. But, how much you can cash on your job, it entirely depends upon, where you stand in the crowd of this field. Largely on country, company and specialization. e.g. A vendor may be paying lesser to an automation engineer than a commissioning engineer from engineering and construction consultant, though both are doing same nature of job. Instrumentation engineers design safety system, maintain control systems and trouble shooting in industry and responsible for smooth operation of plant. If any of the system fails, industry has to face production loss, systems damage, plant shutdown, penalties and losses due to failure of compliance and loss of lives of people and image of industry in society also degrades. Most helpful thing while designing could be the lessons from the past, and techniques which didn’t work and the man-made mistakes, or the responses which didn’t work for which those were designed. These lessons could help to design a robust control system which works flawless and is flexible for more add-on control actions which workers learn from their daily activities. It is one of the most versatile branch of engineering and changing are happening at very fast pace with global competition. Technology we used to use about ten years ago are now being replaced by more reliable and high speed data communication protocols. Similarly, technology being used by industry are getting updated at regular intervals and responsible person should update himself for changes to understand and implement. Instrumentation technologists, technicians and mechanics specialize in troubleshooting and repairing and maintenance of instruments and instrumentation systems. This trade is so intertwined with electricians, pipe fitters, power engineers, and engineering companies, that one can find him/herself in extremely diverse working situations. An over-arching term, “Instrument Fitter” is often used to describe people in this field, regardless of any specialization. In today’s modern world, the top target of every plant management or plant ownership is to achieve the safest and maximum production out of their equipment, machinery and devices. In order to reach that target, one of the major steps it follows is to install good instrumentation in the plant. When we walk through a modern day plant, we find many transmitters, gauges, trolls, control valves, motors, solenoid valves etc. This is all nothing but Instrumentation.But the fact is, that instrumentation can’t do anything alone. It needs some brain that can constantly monitor the readings provided by it and takes actions accordingly to operate the final control elements like valves, motors etc. At the same time, these actions must ensure to operate these devices at optimal parameters as to ensure their health and long-life. This is where the world of control comes in. Control System enables the instrumentation to operate in a way to give you the safest and optimum production. Nowadays, it is fully automatic. Once configured, it brings your whole plant over the screens of control room. This blog has been developed in order to discuss about these two greatest technologies of industrial plants. We will be sharing our experiences, our ideas and our observations. We invite you to be the part of it to contribute it to be the world’s best resource of learning and sharing the experiences of instrumentation and control. What is Piping and Instrumentation Diagram (P&ID) ? What is a Fieldbus ? What is Process Flow Diagram (PFD) ? Why Use a Current Loop?